The new platform is available as an automated investment service that can help brokerages increase their earnings. The platform allows businesses to launch an investment product in just a week and start attracting new clients. You can order the application in the MetaTrader 5 App Store — the store of ready-made broker software. Social Trading. Investors copy deals of a selected money manager to their own accounts and can close them at their will. Also, investors can perform their own trading operations on such accounts. Social trading is the best way forward for amateurs and beginners, in learning how to trade, based on the experience of professional traders. MAM. It is the most popular account type in countries with strict regulation. This product is suitable for professional money managers who wish to have flexibility in managing investors' accounts. MAM is a copier based solution: investors' accounts are not combined into one big trading account but are maintained as stand-alone elements. Investors are not able to trade on investment accounts as they operate in the read-only mode. The integrator emphasizes, that the B2Broker 3 in 1 system runs via API — all copying operations are performed on the application side and do not load the MetaTrader 5 trade server. High execution speeds allow copying of 5,000 orders in less than a second. Being a service provider, B2Broker does not have access to sensitive data, since the system is hosted on the client's side. Mr. Artur Azizov, CEO of B2Broker, commented, "When many providers offer similar products, it can be very hard to differentiate. The launch of our PAMM/MAM service can help brokerage companies make their offer outstanding, both for money managers and investors. 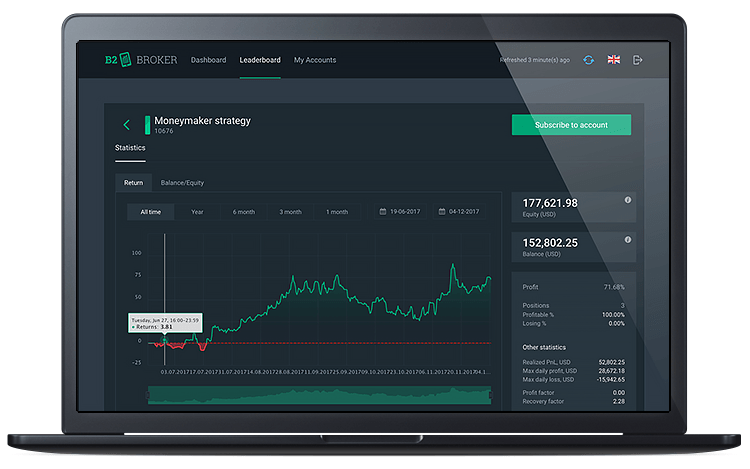 In just one week, any MetaTrader 5 broker can launch our investment platform, which includes web-interfaces with a widget and a leader board of money managers. The price includes a one-time setup fee of $2,000, along with a monthly charge starting at $2,000/month, having a cap at $7,000/month."